Wondering if you’d enjoy the recipes in my “Eating Additive-Free” natural cookbook & grocery shopping guide?? Here’s your chance to take my cookbook for a “test drive” and try one of the recipes for free! Let me know how you like the recipe below. There are over 150 more waiting for you in my cookbook…enjoy! Click here for pricing info, ordering instructions and the complete Table of Contents! Thin/flatten breasts: place on a cutting board, cover with plastic wrap and beat gently with a meat mallet. Mix all spices together and spread over chicken breasts. Bake uncovered for about 20 minutes, until internal temperature reaches 170 degrees. While chicken is cooking, heat oil in a large skillet. Add veggies and sauté until tender. 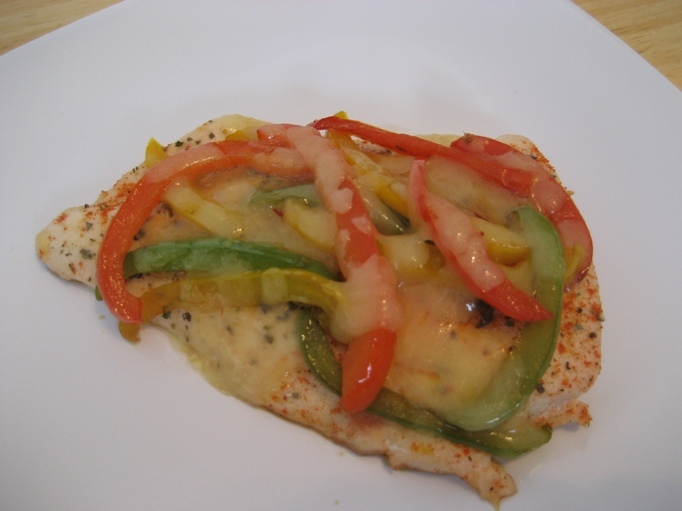 When chicken is done, spoon vegetables over chicken and sprinkle with cheese. Return to oven until cheese melts. Enjoy!